Star Tours is a timeless Disney attraction that was upgraded in 2011. This week we’ll look at the ATLAS simulator. This stands for Advanced Technology Leisure Application Simulator. It’s a metal box on a large motion base. Motion bases have been used on many simulators. One example is Indiana Jones at Disneyland and Transformers at Universal Studios. A motion base is made up with six hydraulic actuators that are programmed to the film playing with the cabin. This coordination makes the attraction feel realistic. Disney planned on using this system to make a ride theme to the film The Black Hole. Sadly the film did not do well, so the ride was canceled. George Lucas was at WDI and saw the concept. This was the birth of Star Tours. The imagineers had ILM produce the ride footage. Disney played some of the footage in one ATLAS simulator with uncoordinated motions. They thought that it would work at the parks, but they did not feel well getting off the simulator. This simulator was at the WDI campus until recently once they decided to remodel. Adventures Thru Inner Space closed on September 2,1985. Star Tours would replace the beloved dark ride. The queue for ATIS was reused and a large Star Speeder was placed in the Mighty Microscope’s spot. They queue was expanded to add a “Droid Room.” It had two animatronic geese from America Sings. They were stripped down to their mechanics. They were repairing other droids or scanning guest. At Disneyland they have only four simulators in a row. You would walk down a large ramp to enter the simulator. The ramp is lifted up on cables or folds up on it’s side with more hydraulics. Please note that they use only one method of ramp movement. 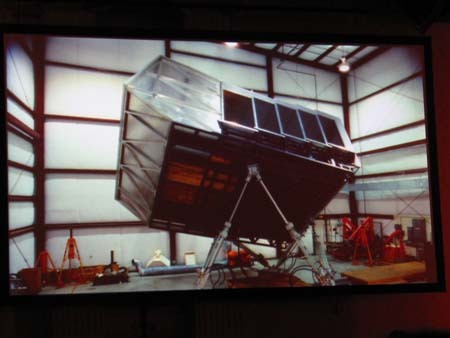 You would enter the ATLAS simulator. The seating is staggered so everyone has a good view. Underneath there are six hydraulic actuators that provided the motion. There is also an air conditioner unit that has a bendy pipe to keep fresh air in the cabin. Thanks for reading this article. Sorry for the delay, technical problems. Next week we will continue our adventures in Rainbow Ridge. Please share this article with your friends and family. You can also like us on Facebook for exclusive content, pictures, and more. We are about to get our 1,000th view so watch the Facebook page for contest! You can also email me at kolbykonnection@gmail.com. Have a fantastic week!